Burnout is a complicated, multi-faceted problem that cannot be solved with a one-size-fits-all solution. Current treatment strategies ranging from mindfulness programs to stress management fall short. 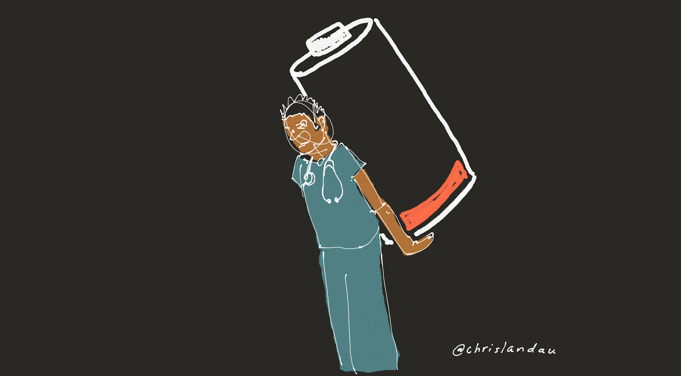 How might we prevent the next generation of physicians from burning out? We propose design thinking as one approach that is well-suited to tackle the wicked problem of physician burnout. Design thinking workshops in medical school are highly interactive. Students and faculty explain solutions to problems through storytelling and prototype demonstrations. Design thinking is a person-centered approach. It starts with the needs and desires of people and involves observation, interviewing, research, and collaboration. Thousands of groups and individuals have explored the practice of design thinking since the 1990s. 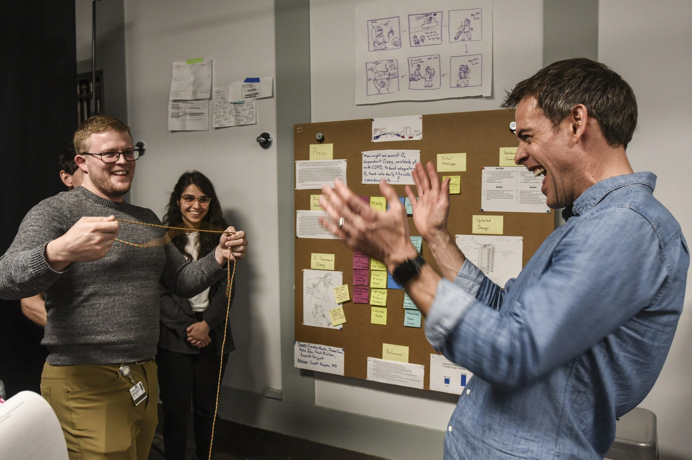 Some of the largest companies in the world, including IBM and SAP, have embraced design thinking as an approach to drive innovation. 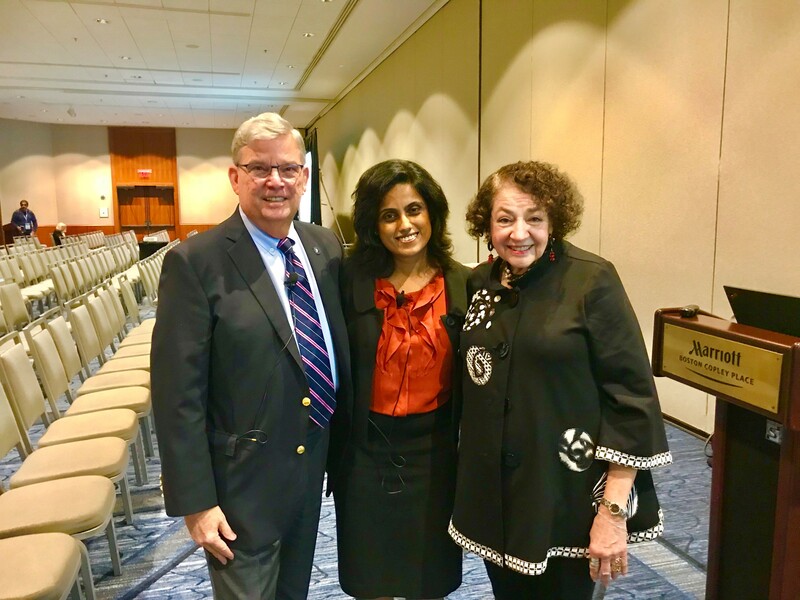 Under the leadership of Dr. Mark Tykocinski, Provost of Thomas Jefferson University and Dean of the Sidney Kimmel Medical College, we launched the first design thinking program at a medical school. In the program, we use an approach called Health Design Thinking to generate creative ideas and solutions aimed at enhancing human well-being in the context of medicine. Design thinking is an open mindset rather than a rigid methodology. It encourages participants to take risks and rewrite the rules of business-as-usual. Health Design Thinking specifically addresses the unique challenges surrounding the healthcare space, such as reducing medical errors, reimagining hospital waiting areas, and creating innovative products that improve comfort and efficiency. It favors open-ended exploration over a straight and narrow path headed toward a given outcome. This creative process involves visualizing ideas, creating tangible prototypes, and looking at problems from different angles. 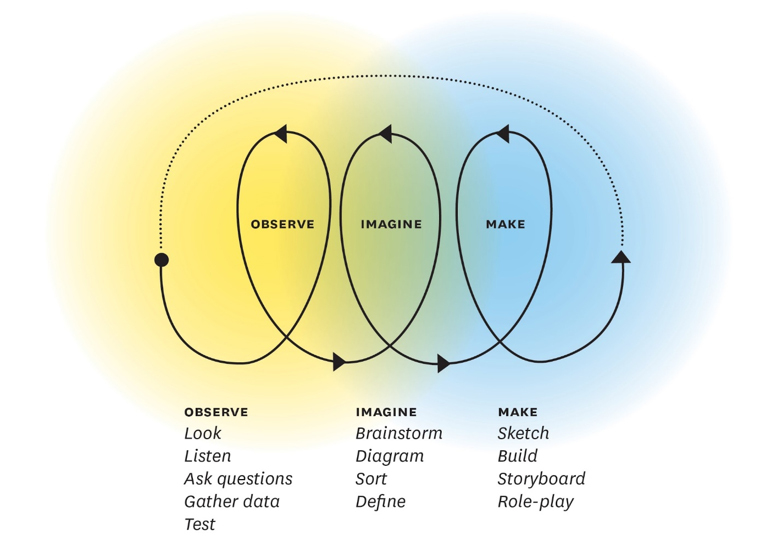 The approach follows the steps of observe, imagine, and make. 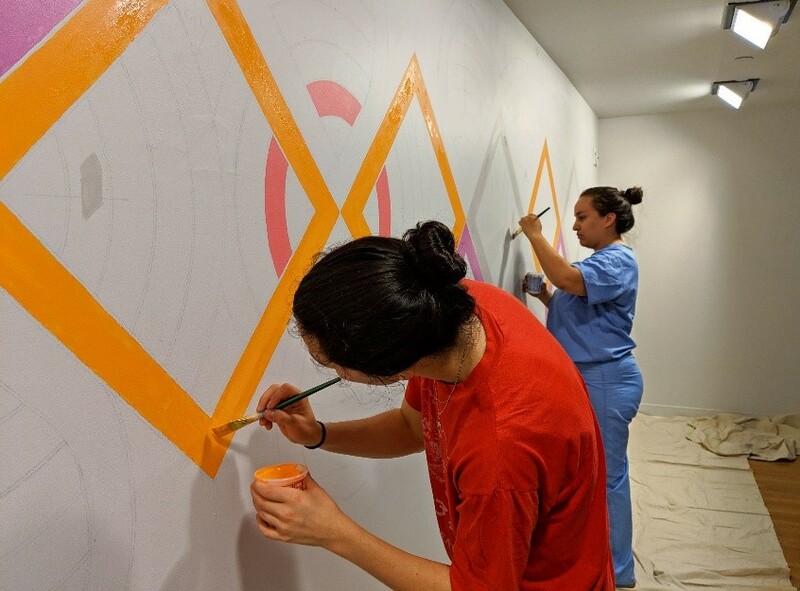 At the Sidney Kimmel Medical College, medical students get hands-on experience applying Health Design Thinking. 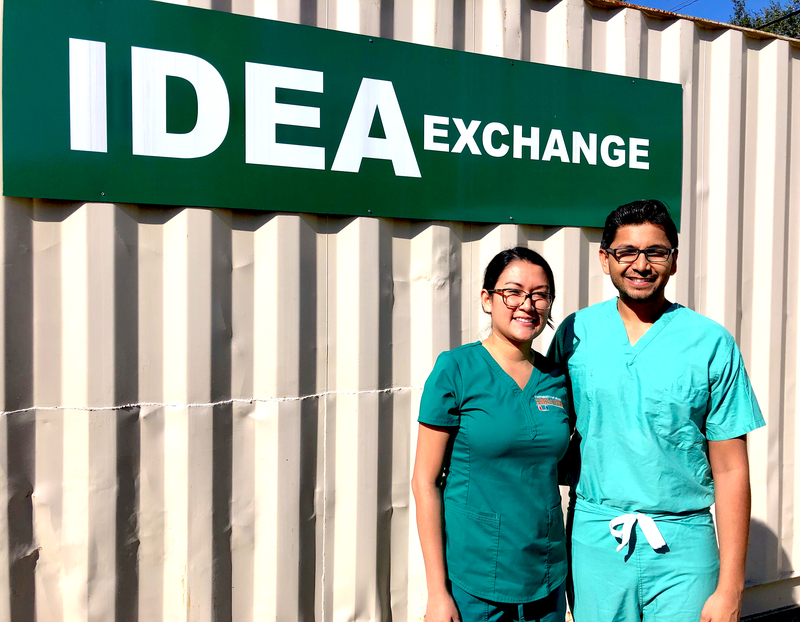 This winter, 26 first-year medical students in the Health Design Thinking program are tackling the thorny issue of physician burnout. The design project brief on burnout that was presented to medical students. We presented them with a design brief that introduced the problem and presented the challenge: design products or services to prevent physician burnout. Working in design teams of 4-5 students, they are applying the observe-imagine-make approach to understanding burnout and creating solutions. The act of observation requires patience, care and humility. This involves looking, listening, asking questions, and gathering research. 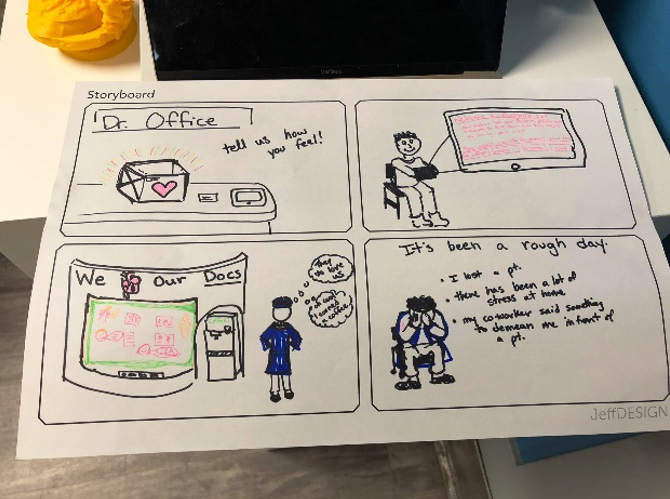 The design teams have been interviewing physicians, including both senior attendings and residents, to build empathy and gain insight into the problem of burnout. During our design workshops, the medical student teams present the findings from their field research on burnout through project visualization boards. The project board is a large vertical display that visualizes a team’s work in progress. The board captures in words and images insights and anticipated results. We find that this flexible, inexpensive format helps teams document, visualize, and communicate their thinking. Project visualization boards like these help design teams to visualize their ideas, document their research and invite dialogue. Currently, student teams are developing solutions that address burnout through the act of prototyping. Prototyping gives physical form and shapes to their ideas. Insights gained through observing users and imagining solutions come to life as tangible products or processes. Prototyping fuels the creative process through making — it is thinking with your hands. Prototypes can take the form of simple sketches, storyboards, physical mock-ups, role-playing, and simulation. 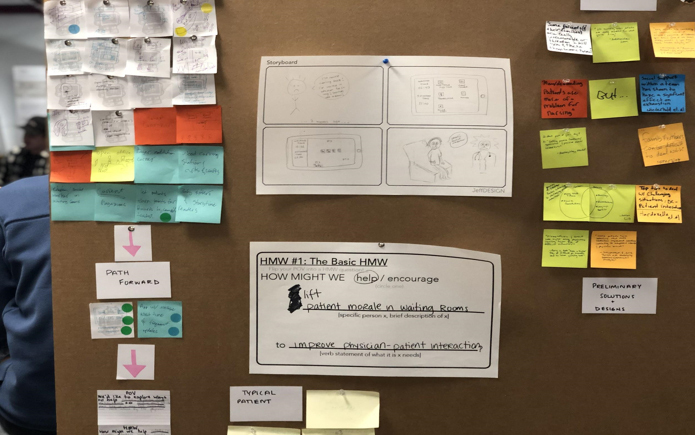 Because co-design is a fundamental principle to Health Design Thinking, we felt it was important to include all users — from the trainees who will be susceptible to burnout to current physicians experiencing symptoms of burnout — in the design process. Too often, proposed solutions in healthcare are driven from the top-down, are one-sided and lack perspective. In the final part of the program, students will present their prototypes. We look forward to giving you an update on their proposals as the semester wraps up. 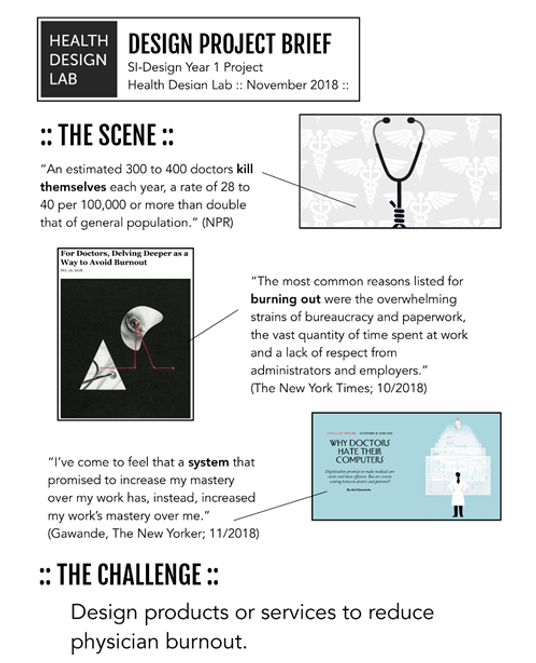 We do not claim that Health Design Thinking will solve the crisis of physician burnout; rather, approaching this epidemic from a human-centered perspective may be the first step in discovering a cure.